Sadly the business world is a Windows world, which means I need Windows on my MacBook Pro to earn some money.. I’ve been using VMware Fusion for a while. Unfortunately the standard key mapping for “Print Screen” is F13, which is not included on my MBP keyboard. 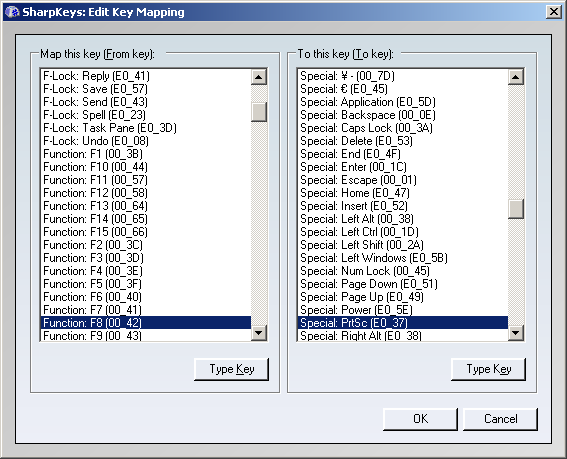 The solution I found was to key map a different function key myself using the free application SharpKeys. I’ve chosen the F8 button (you need to hold the fn key as well), below is a screenshot of the correct setting. After writing the setting in the registry and rebooting Windows, my F8 key is screenshot-ing away! You can also make screenshots of the most front window by using alt-F8. Next Tour de France ringtone. Very useful answer.. thnx much!! I found another neat solution from Mac – from VMWare communities – thought of sharing with you..
Command+Shift+3 – Capture entire screen and save as a file. Command+Control+Shift+3 – Capture entire screen and copy to the clipboard. Command+Shift+4 – Capture dragged area and save as a file. Command+Control+Shift+4 – Capture dragged area and copy to the clipboard. Command+Shift+4 then Space bar – Capture a window, menu, desktop icon, or the menu bar and save as a file. Command+Control+Shift+4 then Space bar – Capture a window, menu, desktop icon, or the menu bar and copy to the clipboard.